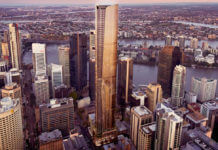 Artist's impression of the new 90 level Meriton development in Surfers Paradise. The 22 storey International Beach Resort in Surfers Paradise will soon make way for a new 90 level residential tower by property giant Meriton. Meriton has purchased the Surfers Paradise Boulevard site for $58 million in a deal that settles on February 28th. Originally named Apollo and built in the 1960’s, the 22 storey International Beach Resort is now vacant with Meriton planning to start demolition as early as next month. It is expected that construction will commence on the yet to be named tower in June this year, pending DA approval. The tower which is believed to be between 290-310m high may end up higher than Spirit Tower which is 298m and will have higher floor levels than the 78 storey Q1 Tower. 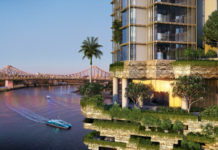 Meriton founder Harry Triguboff told the Gold Coast Bulletin that the Gold Coast was displaying new found vibrancy that gave him confidence to make the big investment. “The Surfers site is the best in town — the sort of property I’ve always dreamed of having on the Gold Coast,” said Mr Triguboff. “With a site like this one, the sky’s the limit and we will do the Gold Coast proud. 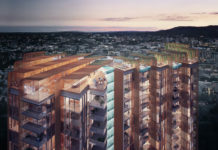 Designed by SJB Architects, the project is said to boast a clever design which will give all of the 270 serviced apartments and 300 residential apartments in the development direct ocean views. The tower’s design has been split into three unique tiers, each with coloured glass panels and a circular illuminated halo creating a beacon effect at night. An Art Deco inspired podium is planned which would feature a large timber deck, lobby cafe, restaurants as well as seperate pools and recreation facilities for hotel guests and apartment owners. The development application which is still being detailed will be submitted by the end of February.